From some of the world’s highest mountains to the largest deserts, India is a heavily populated country that spans nearly 2.09 million square kilometers. With a population of 1.35 billion and a vast amount of land to cover, a luxury train journey in India is an excellent way to tour the country without contending with overwhelming crowds, jam-packed buses, or public trains. This is the newest rail in India (launched in 2010) and claims also to be the most luxurious. 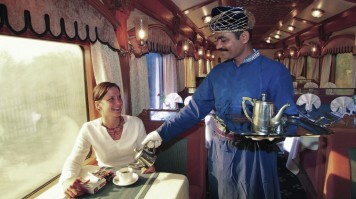 Maharaja Express Train offers 5 routes that serve some of India’s most sought-after destinations. The train’s interior and décor are inspired by the opulent lifestyle of the royal Maharajas (the title for an Indian prince). The old-world simulation meets seamlessly with 5-star amenities, making this one luxury train in India that you won’t soon forget. Some features of Maharaja Express Train not found with other luxury train companies include a 24-hour on call paramedic on board, TV and CCTV in all public areas of the train, generously spacious cabins, and meals to suit everyone’s dietary needs/requests. Highlights of the trips themselves include guided walking tours, cultural immersion through insider experiences, and national park excursions. 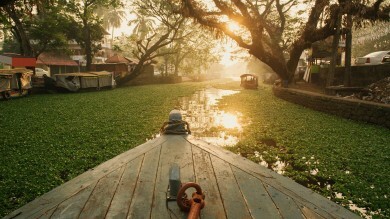 Popular routes: Maharaja offers seven different routes leaving from Mumbai and Delhi. The most popular are Treasures of India (Delhi – Agra – Ranthambore – Jaipur – Delhi), Heritage of India (Mumbai – Ajanta – Udaipur – Jodhpur – Bikaner – Jaipur – Ranthambore – Agra – Delhi) and The Southern Jewels (Trivandrum – Chettinad – Thanjavur – Mahabalipuram – Mysore – Hampi – Goa – Ratnagiri – Mumbai). Starting price: USD 3,850*. Note that tours are not available during the months of May – August. Launched in 1982 by Indian Railways, Palace on Wheels has recently merged with Royal Rajasthan on Wheels (launched in 2009), forming a partnership that strongly promotes luxury train travel throughout the Rajasthan region. 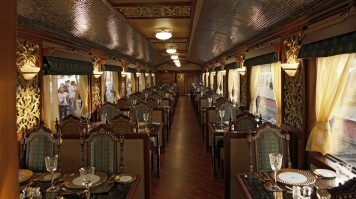 The coaches and cabins are decked out and decorated in such a manner even the royal Maharajas would approve. Constant upkeep and renovations keep comfort levels sky-high. The two lavish restaurants serving Chinese, Indian, and Rajasthani cuisines, a fully stocked lounge bar, a spa, 24/7 concierge service, and a personal butler ensure passengers are never left wanting anything. 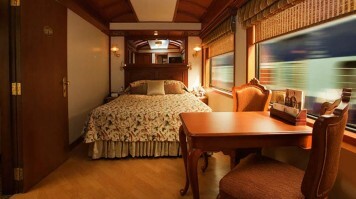 This luxury train journey commences and terminates at the same destination in Delhi. Every tour starts on a Wednesday and runs until the next Wednesday. Passengers can choose between four to five date options per month. Popular route: Delhi – Jaipur – Sawai Madhopur/Ranthambore National Park/Chittaurgarh – Udaipur – Jaisalmer – Jodhpur – Bharatpur/Agra – New Delhi. Starting price: During high season (October – March) single occupancy cabin costs USD 6,055 and double occupancy cabin costs USD 9,100. Low season (April – September) calls for USD 4,550 for single occupancy cabin and USD 7,000* for double occupancy cabin. Deccan Odyssey is a remake of the imperial times of the Maharajas with a decadent interior that’s fit for Indian royalty. Cozy furniture and personalized guest amenities can be found in every coach and the décor reflects different eras that have existed throughout the southern Indian peninsula. 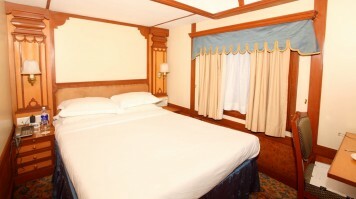 Each cabin is equipped with a wardrobe, safe, air conditioning, Wi-Fi, telephone, and a 24/7 personal attendant. This train has two different coaches that serve as restaurants, one as a bar, and one as a spa. Additionally, there is a Conference Coach with private rooms and secretarial services. Deccan Odyssey was the winner of Asia’s Leading Luxury Train at the World Travel Awards in 2014, 2015, 2016, and 2017. It was also awarded the Best Luxury Train in India in 2015. 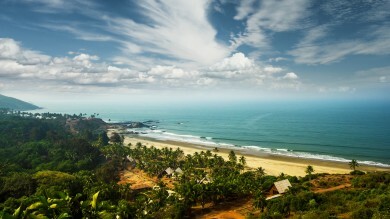 Deccan Odyssey offers six unique journeys, all of which last for 7 nights/8 days with the start and end points in Mumbai and Delhi respectively. Popular routes: Jewels of Deccan (Mumbai – Bijapur – Aihole – Pattadakal – Hampi – Hyderabad – Ellora Caves – Ajanta Caves – Mumbai) and Hidden Treasures of Gujarat (Mumbai – Vadodara – Palitana – Sasan Gir/Somnath – Little Rann of Kutch – Modhera/Patan – Nashik – Mumbai). Starting price: USD 6,100*. There are no journeys in June, July, or August. It is a more budget friendly option when compared to the three above-mentioned train companies. Although much cheaper than its competitors, Royal Orient still brings to the table comfortable cabins, spacious bathrooms, hot and cold water, two multi-cuisine restaurants, one bar, and a library. A much smaller train with only 13 coaches, Royal Orient also provides a more intimate experience. This train runs all year round with prices reflecting high and low seasons. This train has only one route, commencing and terminating in Delhi over the course of 7 nights and 8 days. Passengers visit iconic sites including the Chittaurgarh Fort, Jantar Mantar, a lion sanctuary, and the Mausoleum of Nawab Mahabat Khanji. Popular routes: Delhi – Chittaurgarh/Udiapur – Junagarh/Veraval – Sesangir/Dilwara – Palitana/Sarkhej – Ahmedabad – Jaipur – Delhi. Starting price: Single occupancy in high season (October – March) costs USD 2,800 and double occupancy in USD 1,600 per person. In low season (April – September) single occupancy costs USD 2,100 and double occupancy costs USD 1,200* per person. 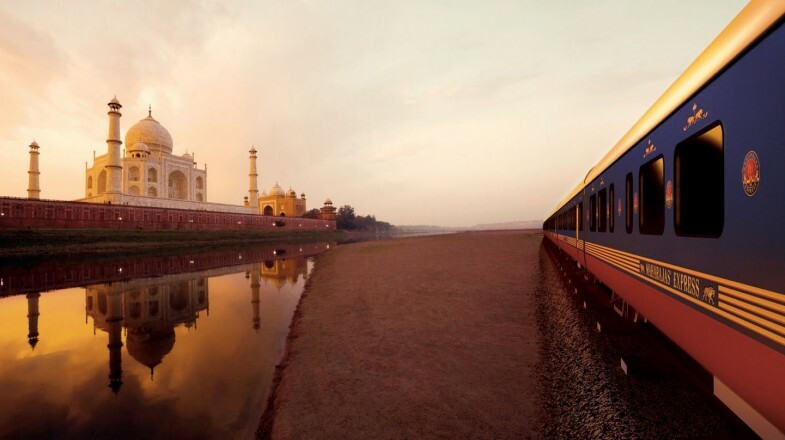 Luxury trains in India offer visitors a unique way to tour a potentially-challenging country. With all the comforts of home and then some, luxury train travel provides an efficient way to see many iconic sites, enjoy the scenic countryside, explore multiple cities, and enjoy the Indian hospitality and culture throughout the journey.